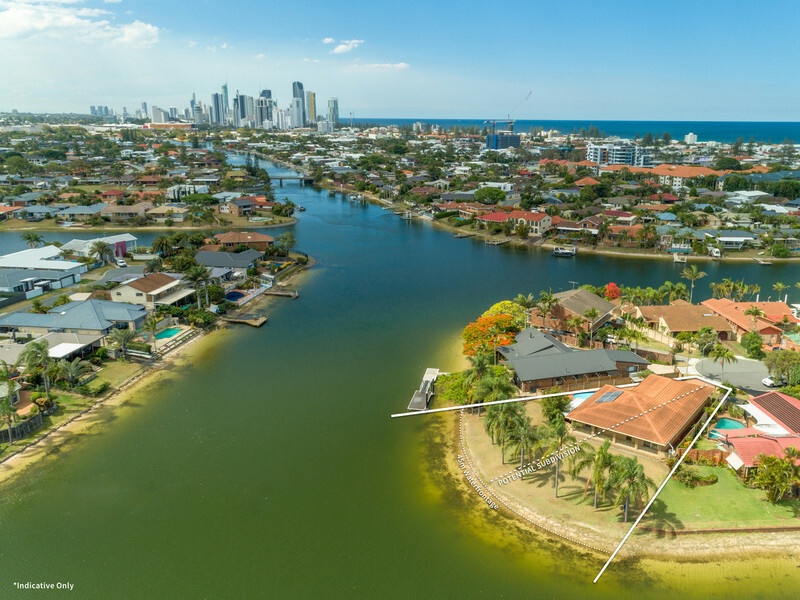 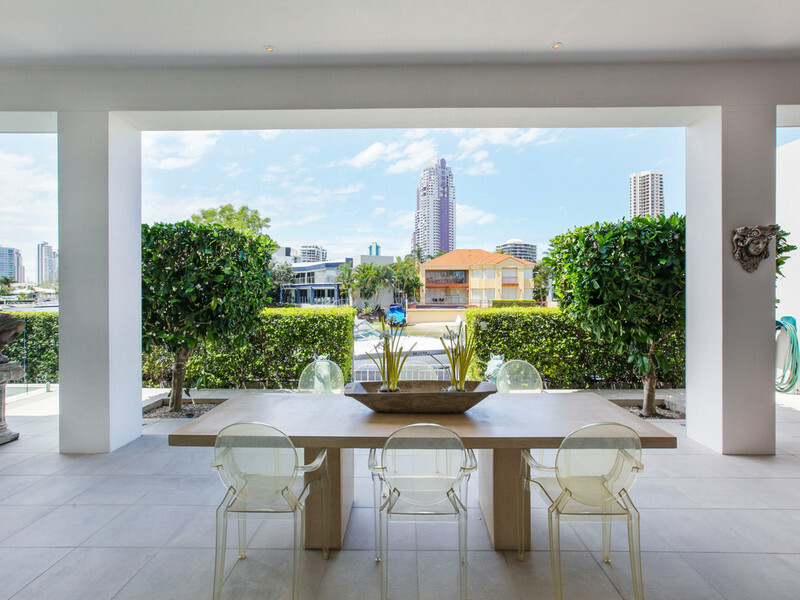 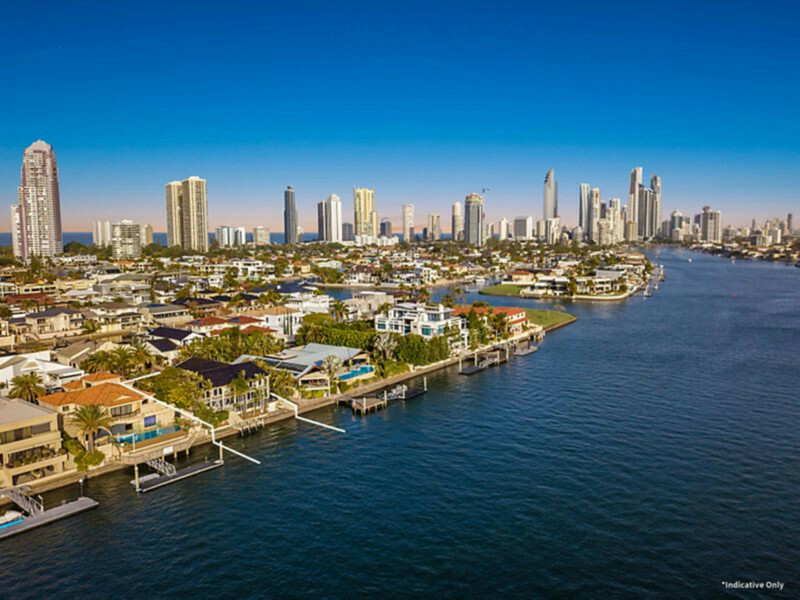 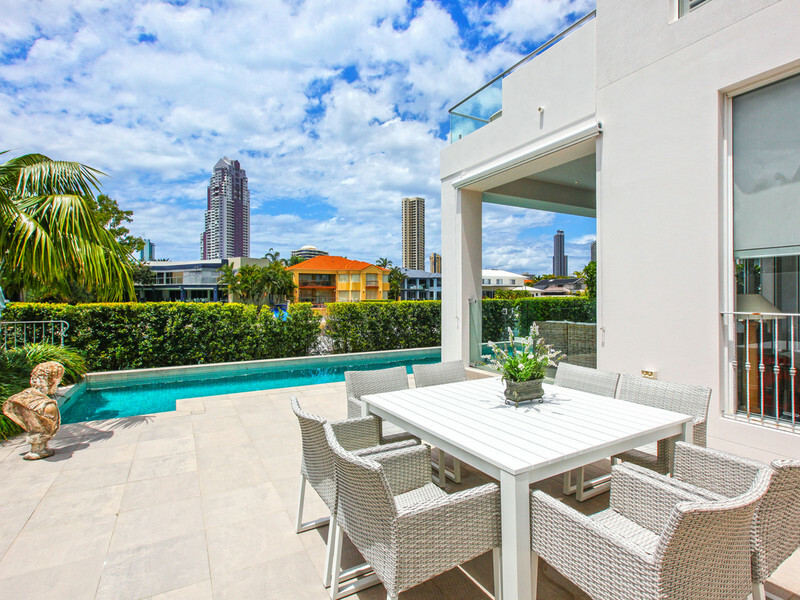 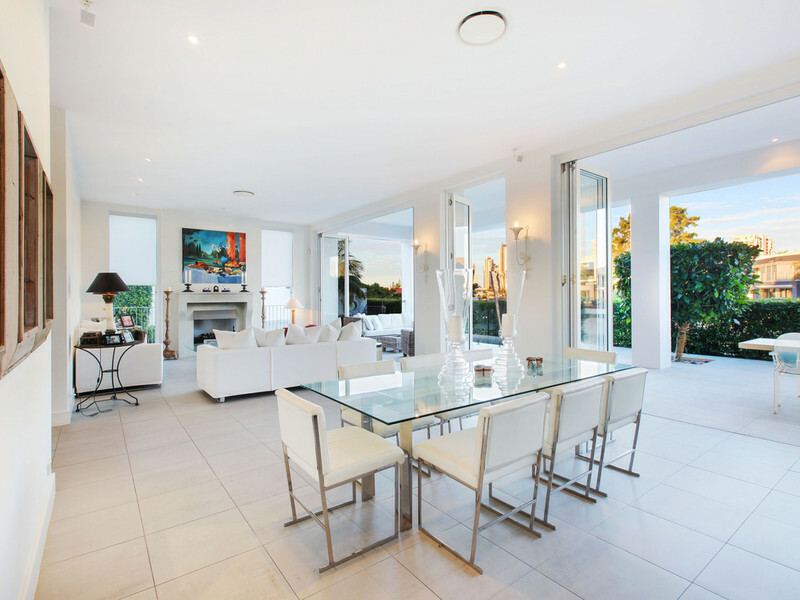 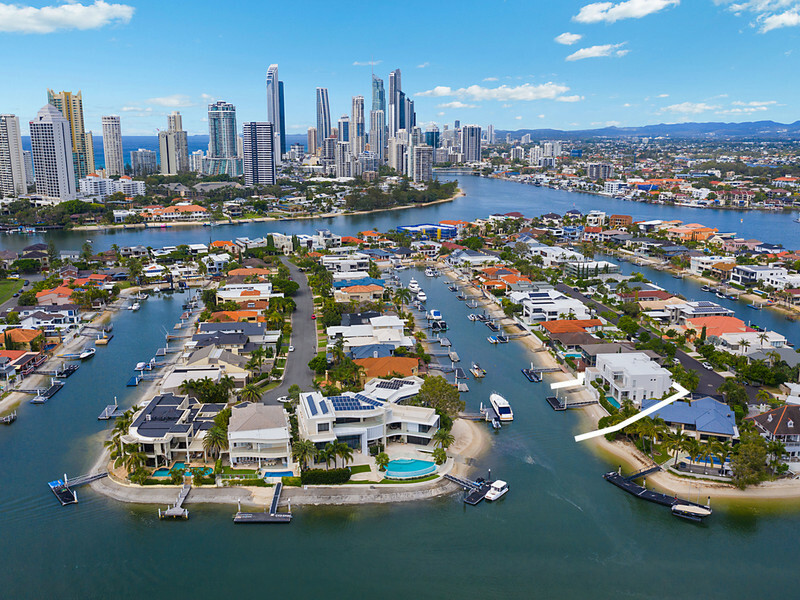 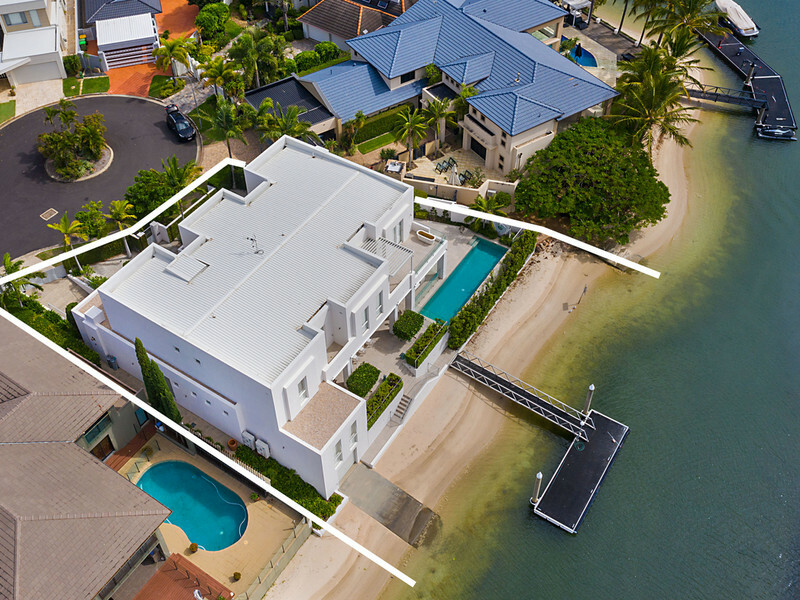 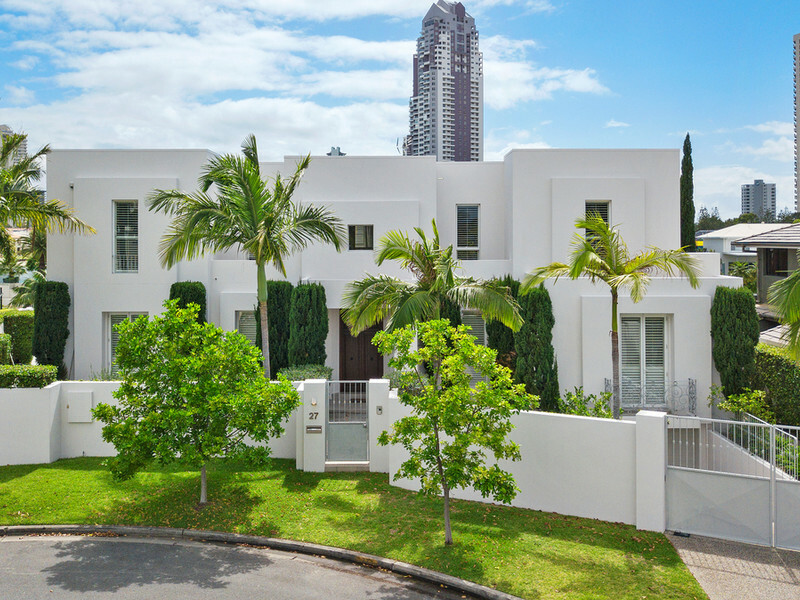 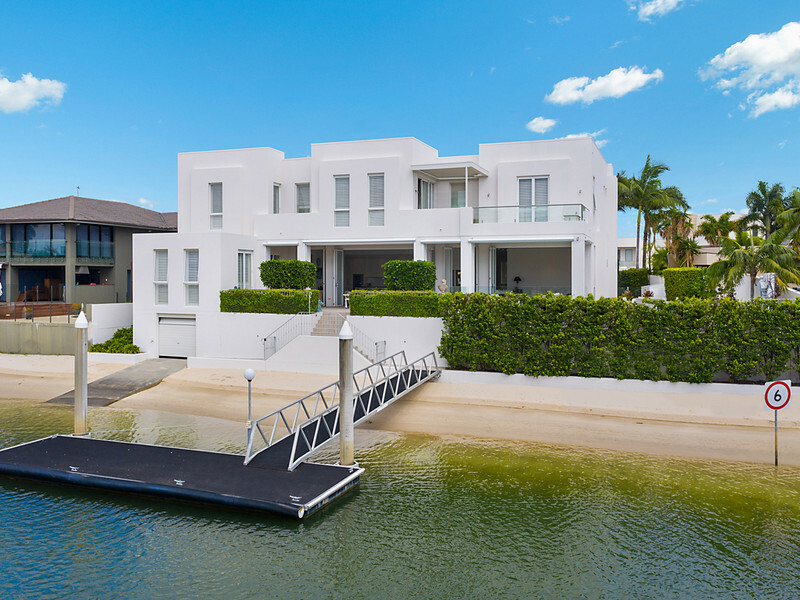 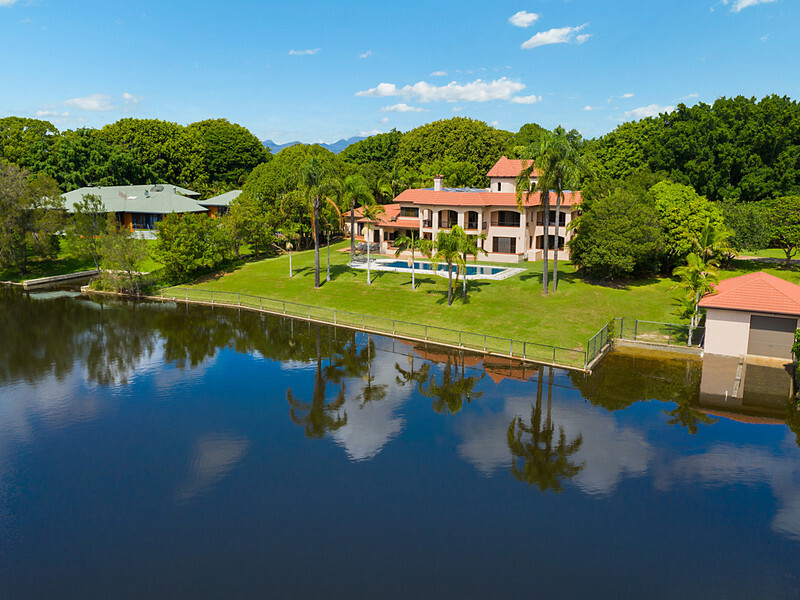 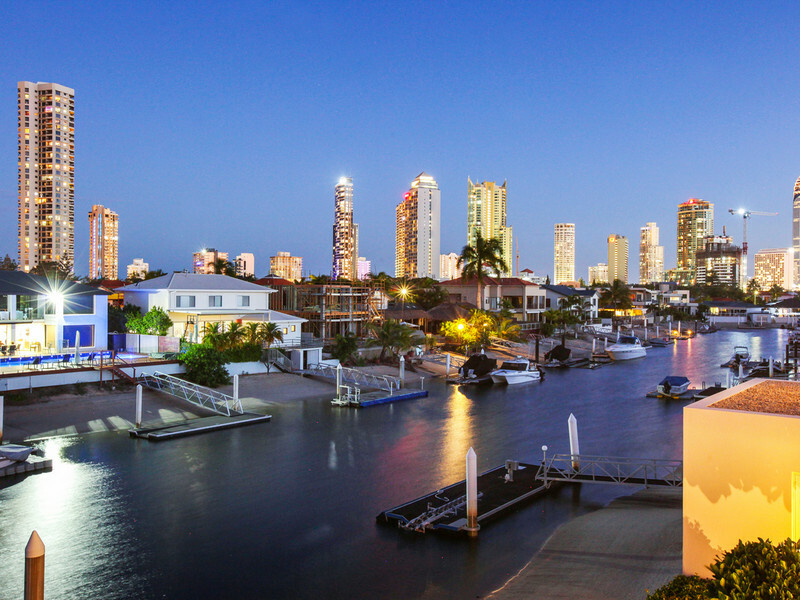 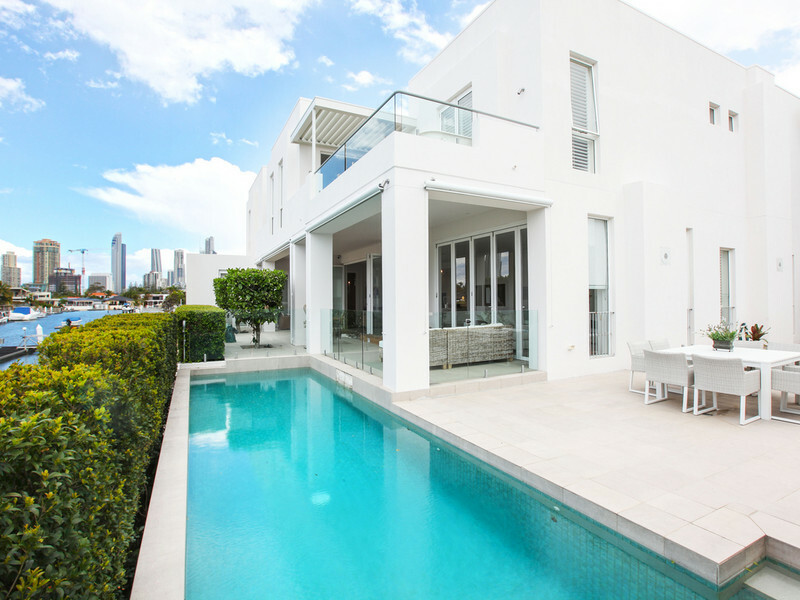 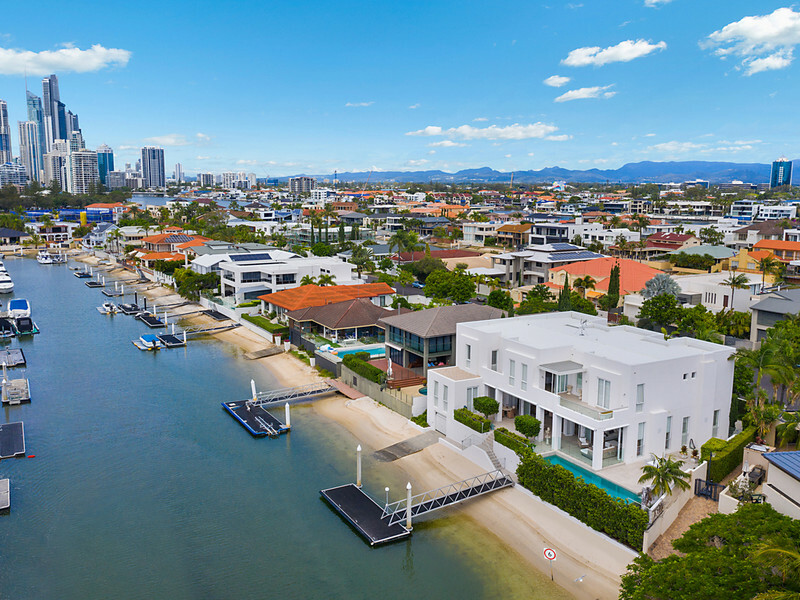 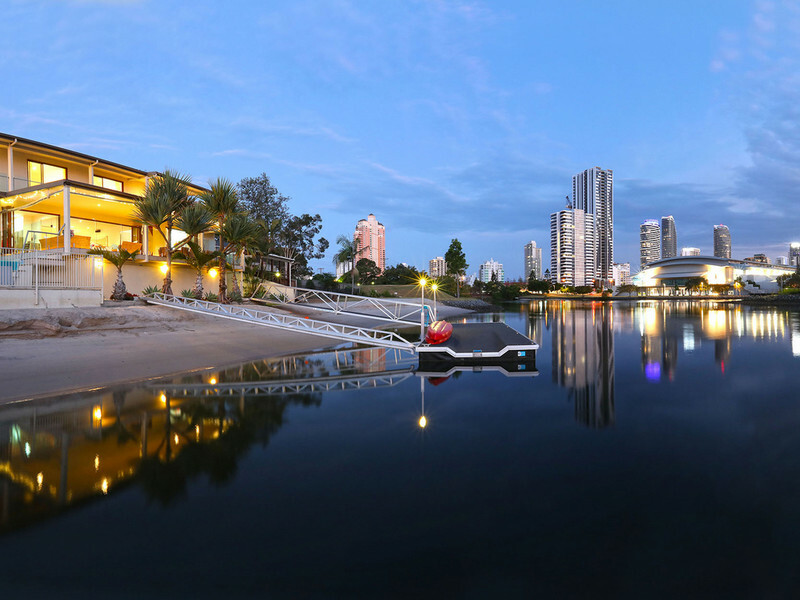 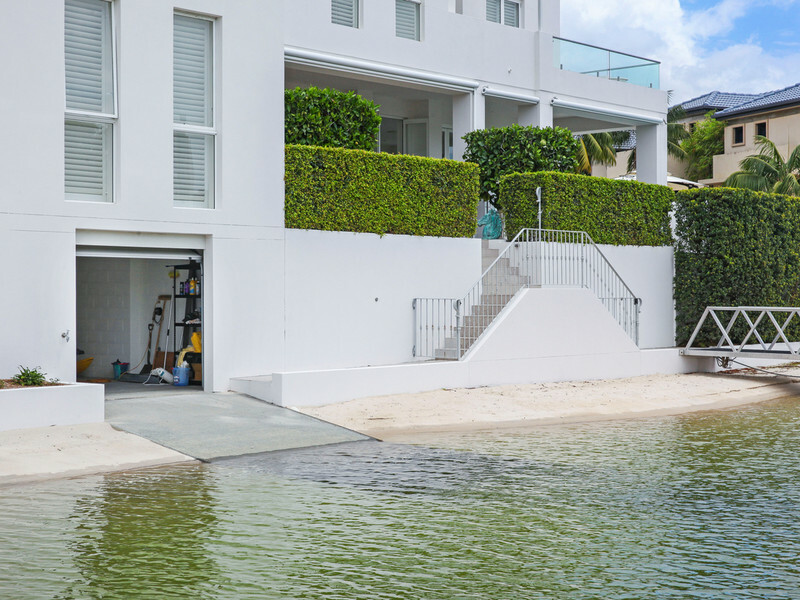 The Gold Coast skyline lingers beyond 33 metres of wide waterfrontage from the classic interior of this tri-level home in the prestige precinct of Paradise Waters. 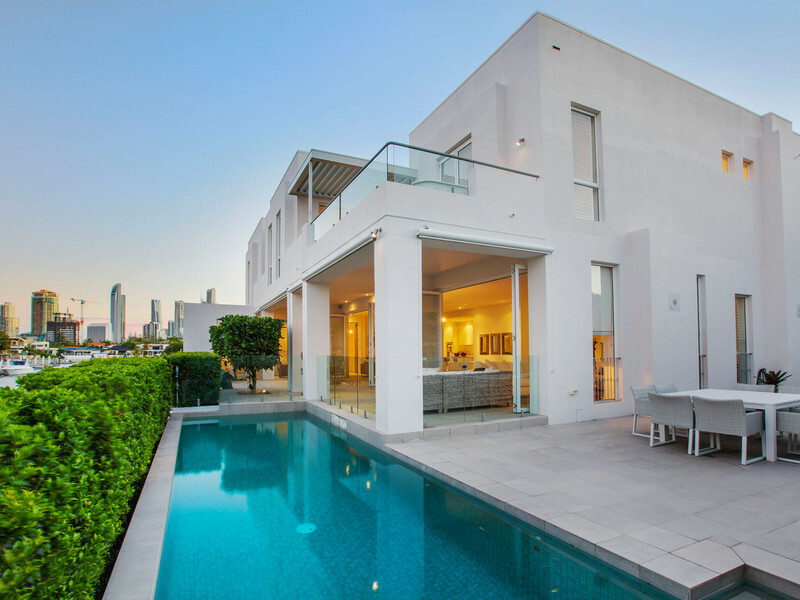 Modern architecture is punctuated with classic French provincial influences including a structured courtyard garden entry with olive trees, lavender and pencil pines. 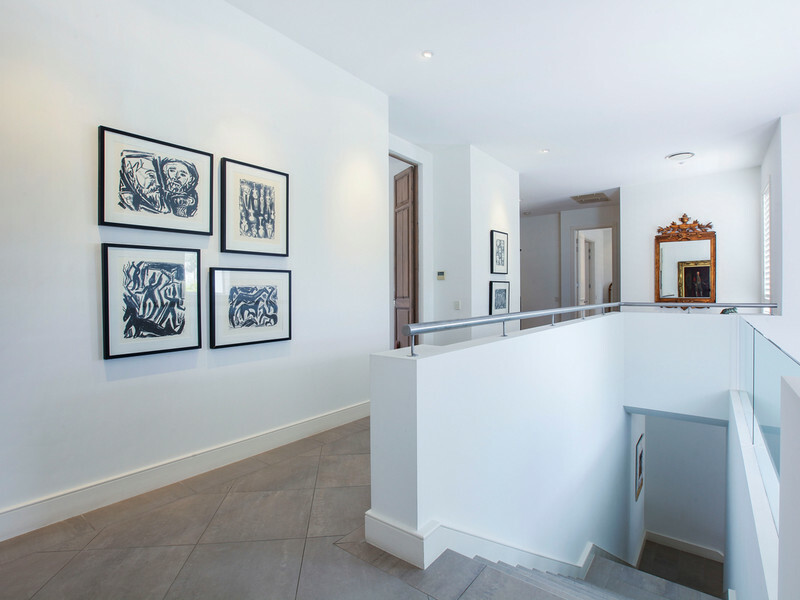 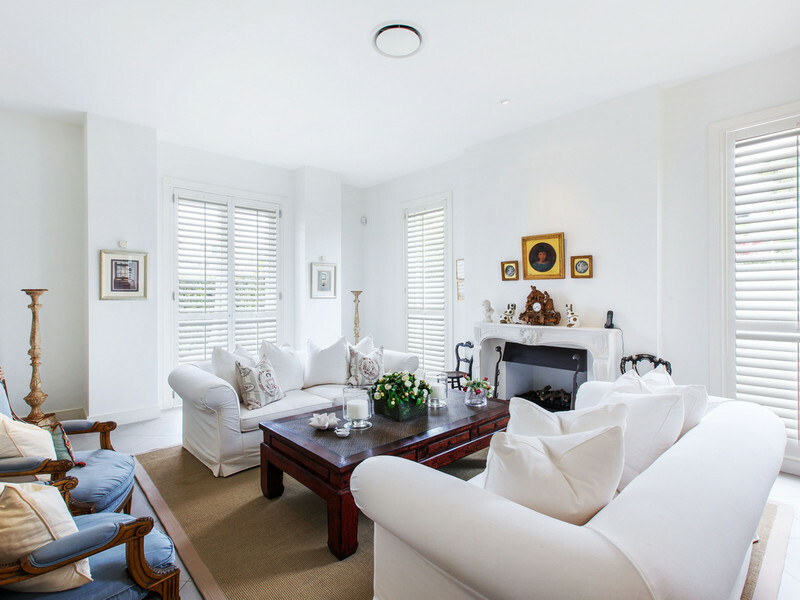 Interiors are timeless, emanating relaxed elegance through cement-style porcelain floor tiles, soaring ceilings, white plantation shutters, three gas-log fireplaces and antique timber doors sourced from Spain. 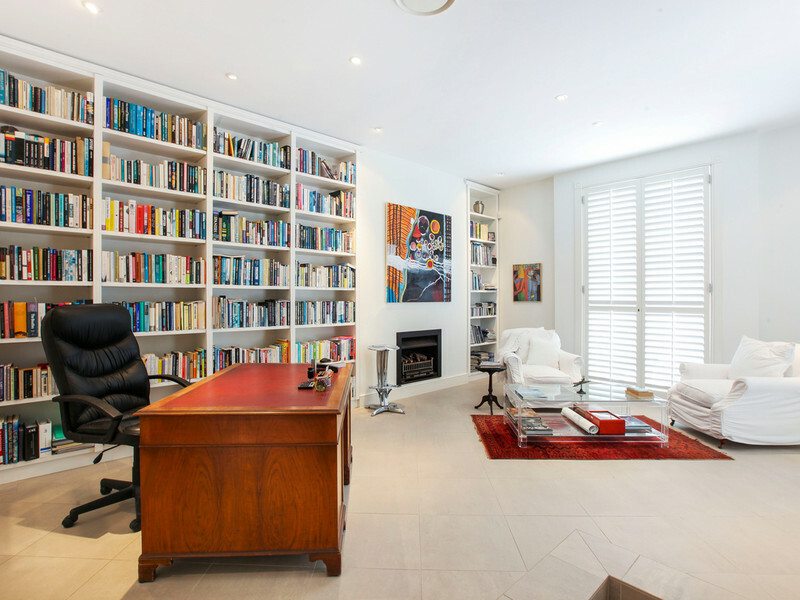 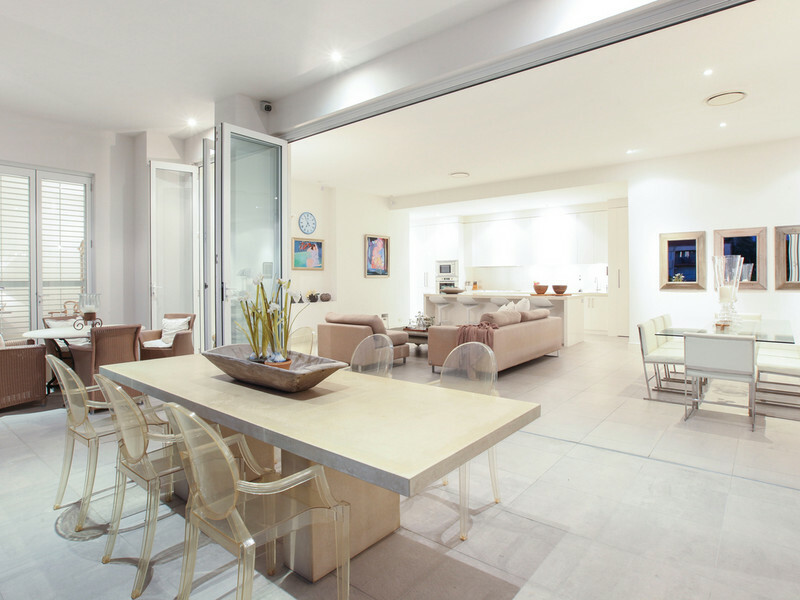 The substantial floor plan balances convenience, opulence and space for the modern family to include an internal cable lift, drawing room, fluid lifestyle space with integrated Bose surround sound, butler's pantry, five bedrooms all with ensuites, and an executive study with a library, filing room/safe room and Juliet balcony. 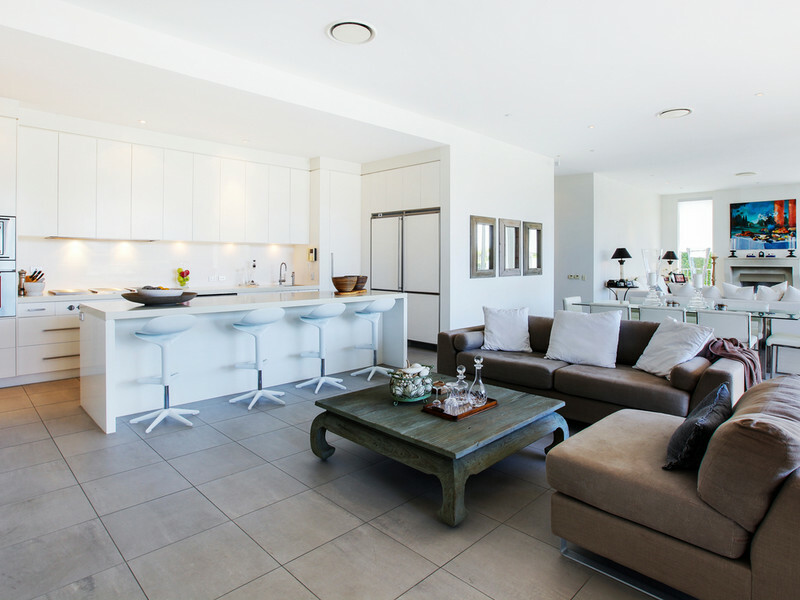 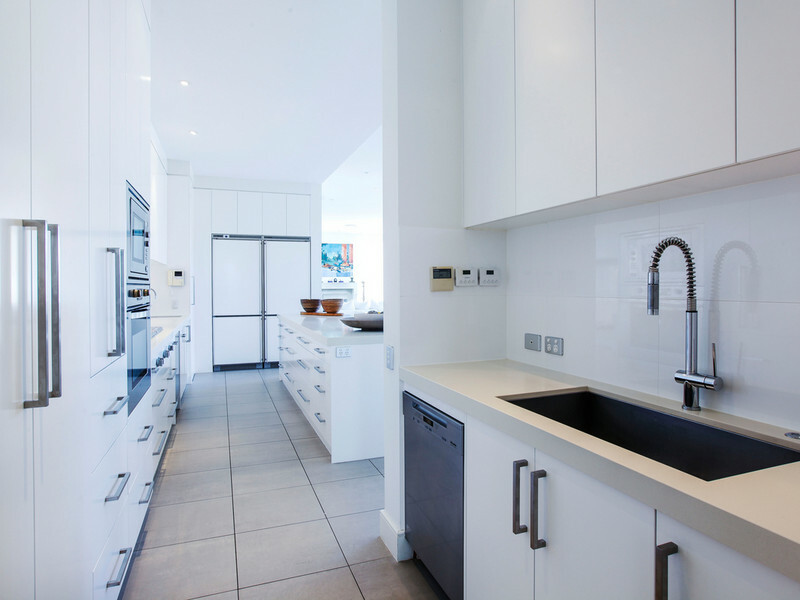 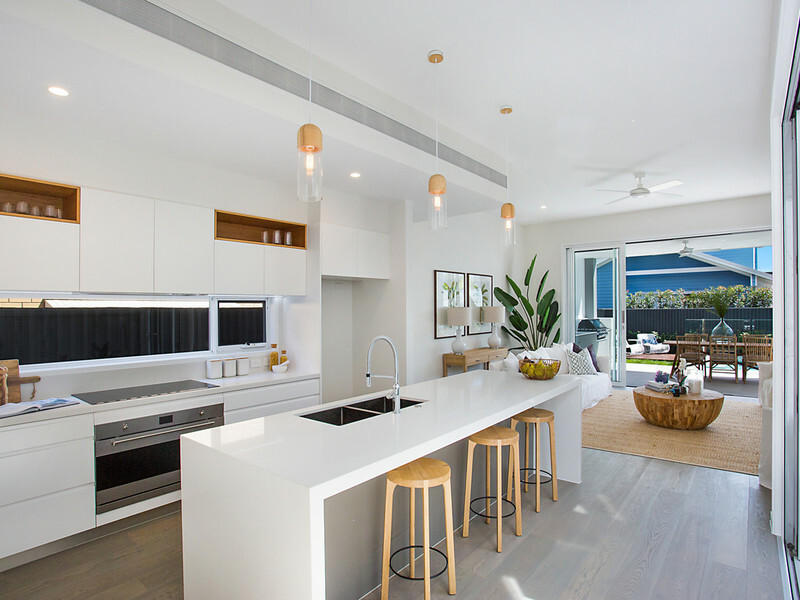 The extensive social space is open plan, interactive and light filled, serviced by a custom kitchen equipped with Italian stone surfaces, a scullery, walk-in pantry, quality Gaggenau, Miele and Liebherr appliances, wine fridge and Zip hot water tap. 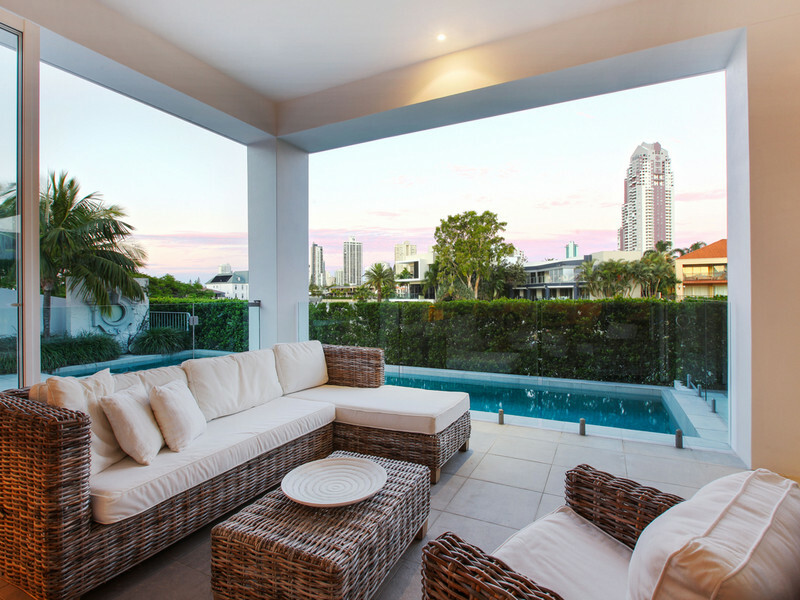 Glass doors fold back for seamless interaction with a sheltered alfresco entertaining, lounging and dining terrace with electric blinds. 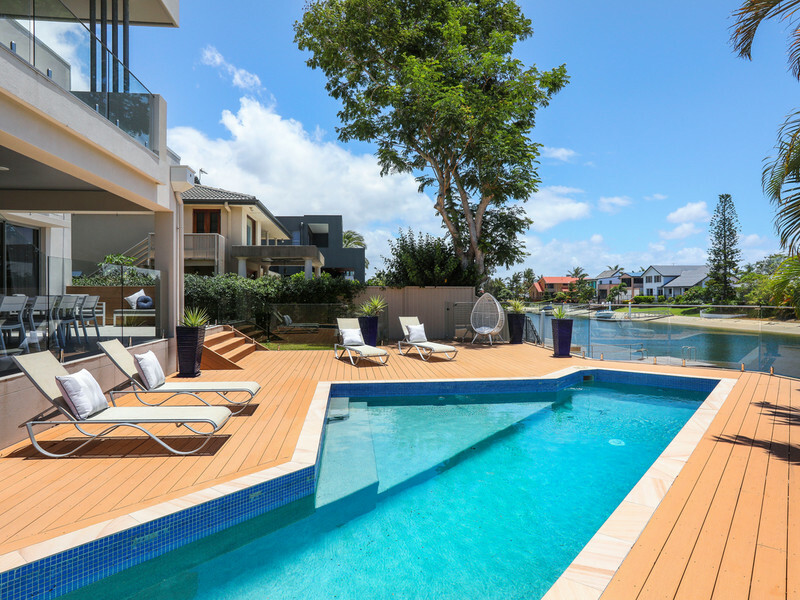 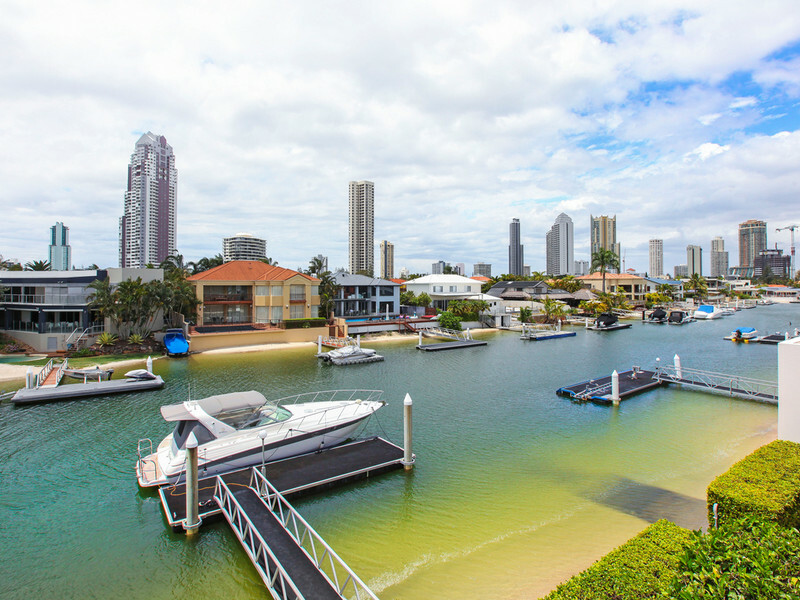 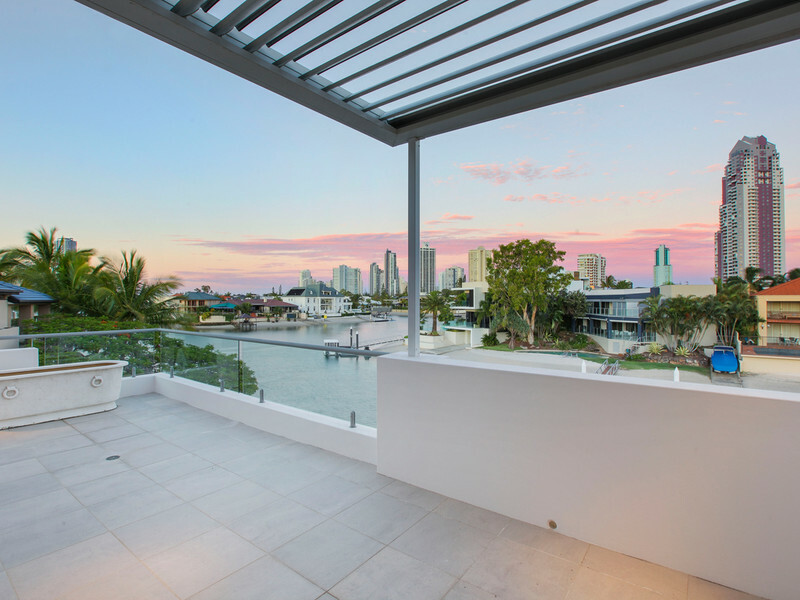 Frameless glass provides clear views of the turquoise-tiled lap pool, sun lounging terrace, private beach, 12m pontoon with power and water, boat ramp, full sized boat shed, wide waterways and high-rises of Main Beach and Surfers Paradise. 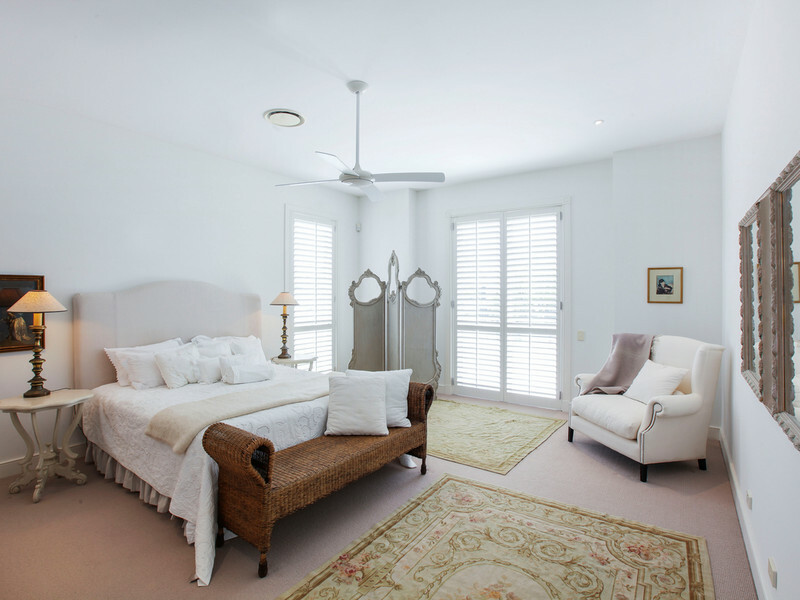 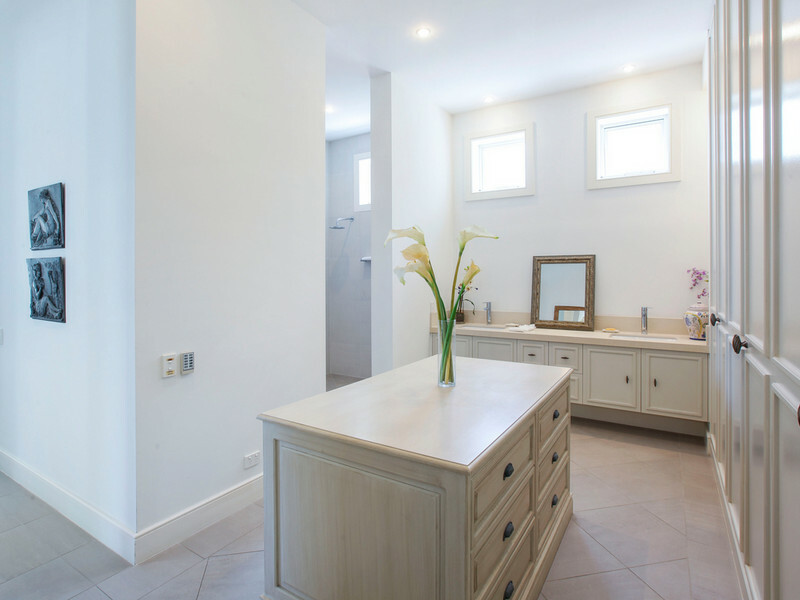 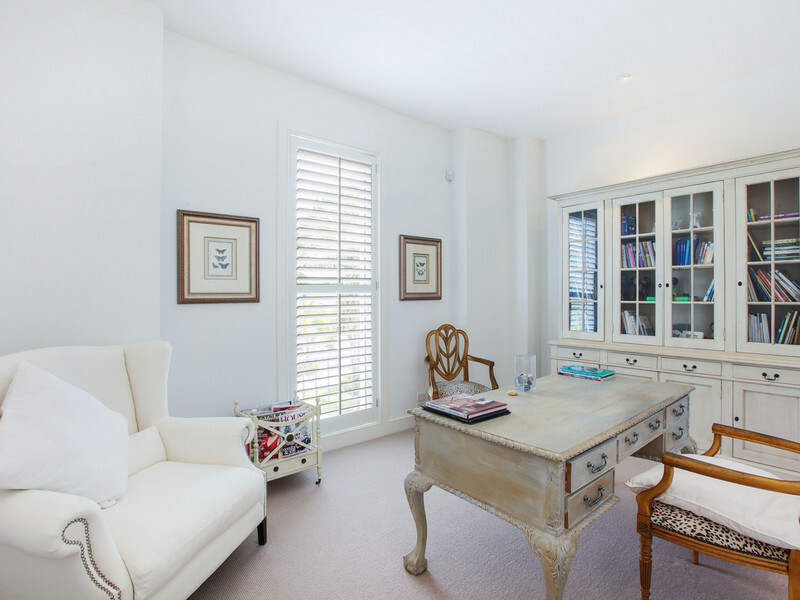 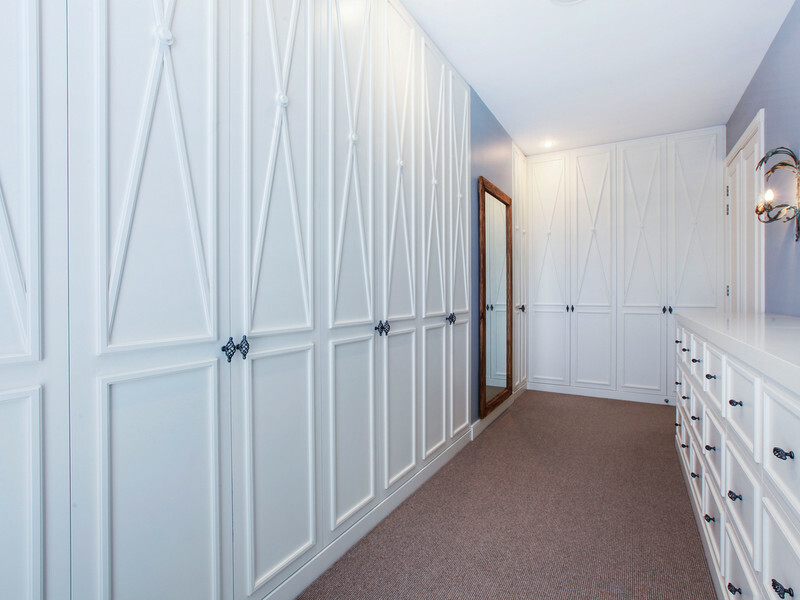 Double doors open to the guest wing with a sitting area, pool access, dressing room and ensuite. 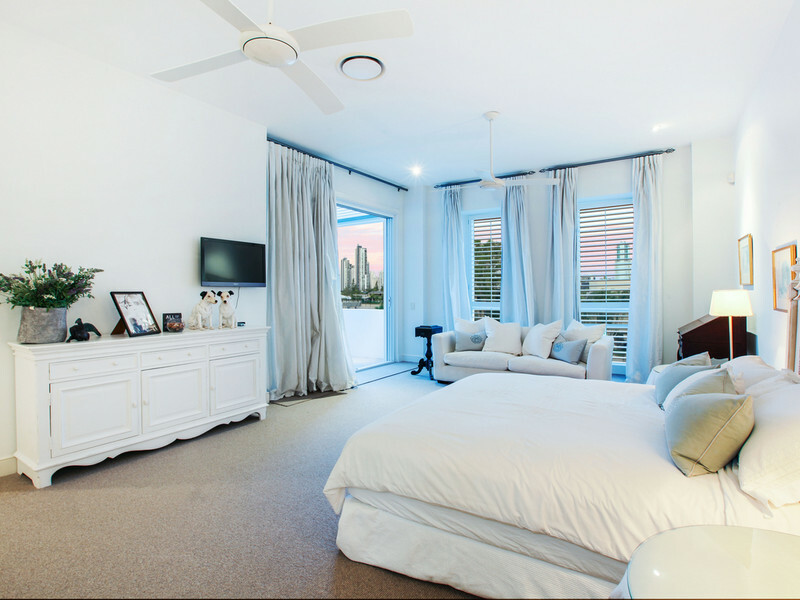 There is a gallery, butler's pantry and four spacious bedrooms with ensuites upstairs including the luxury master suite affording relaxation space, a waterfront balcony with skyline views, a dressing room, and a fully tiled ensuite with twin showers, his and hers vanity and freestanding feature bath. 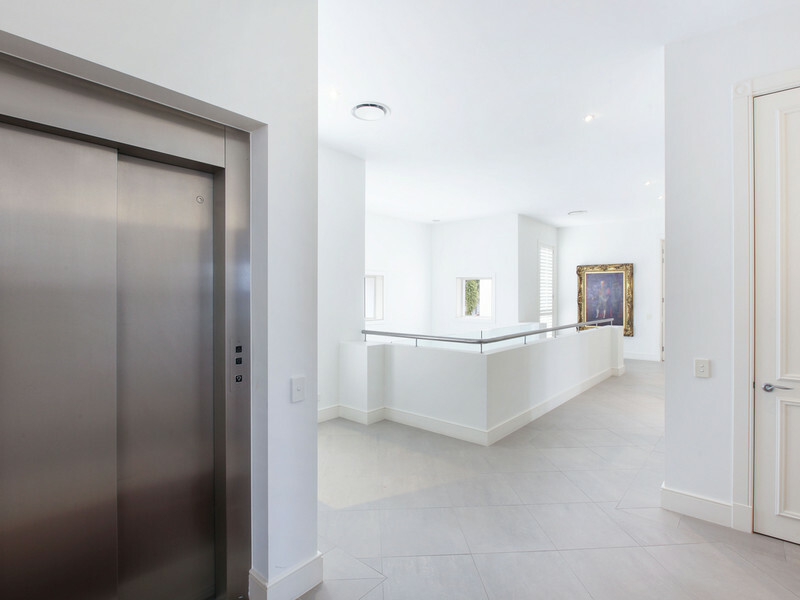 The internal cable lift accesses all three levels including the basement which provides accommodation for at least six vehicles and has a storage area, storeroom, workshop or home gym, and a wine cellar. 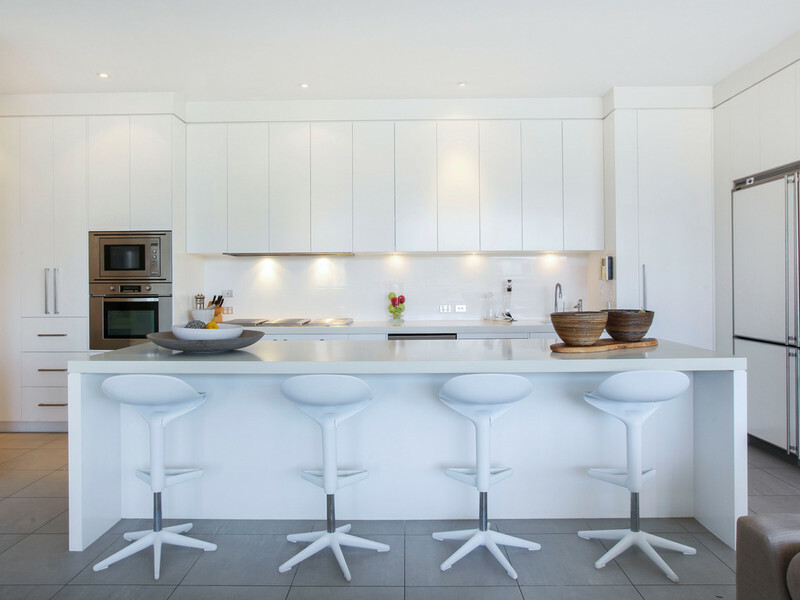 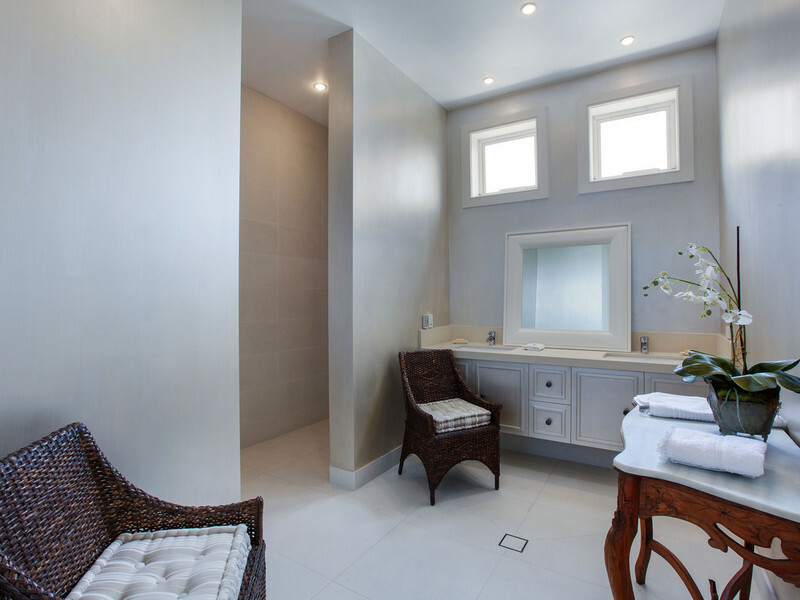 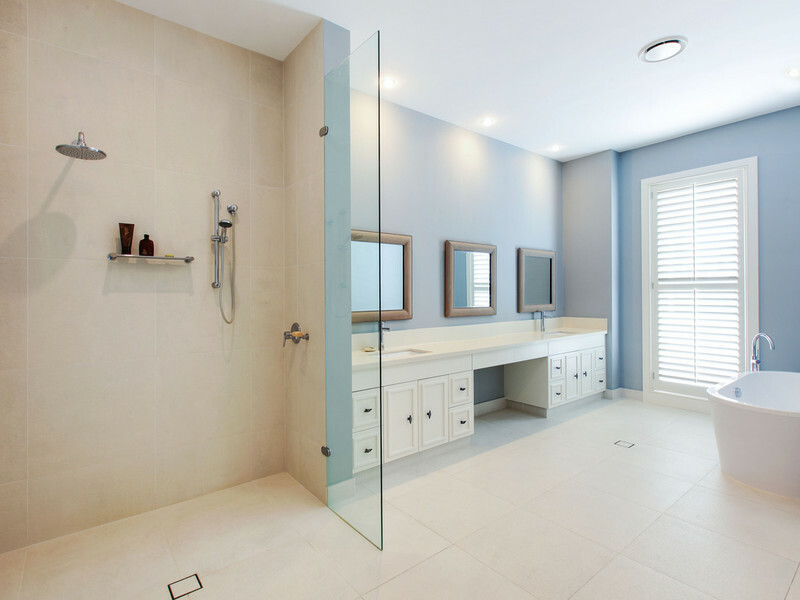 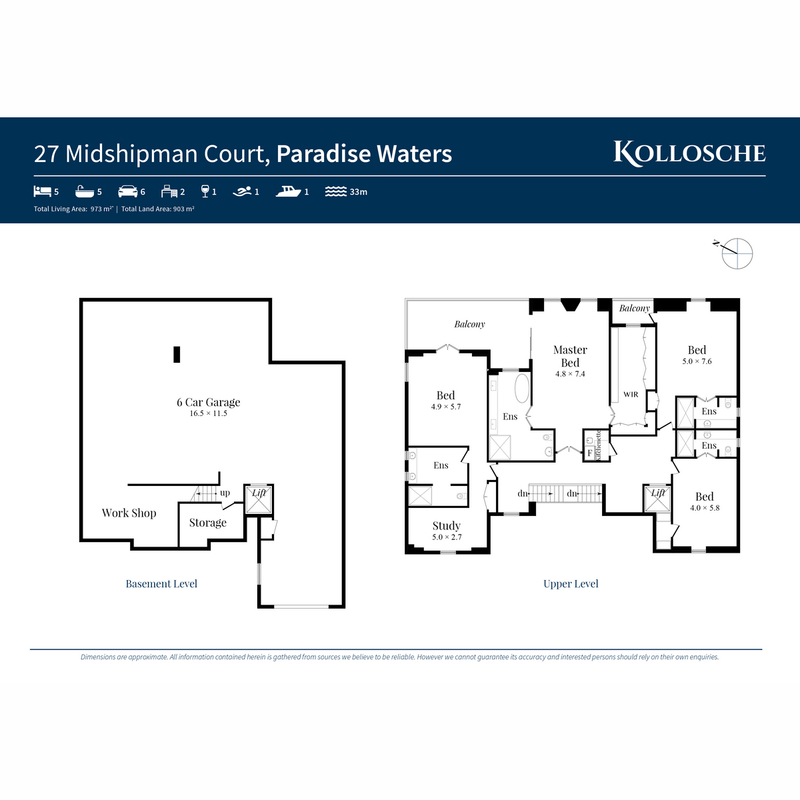 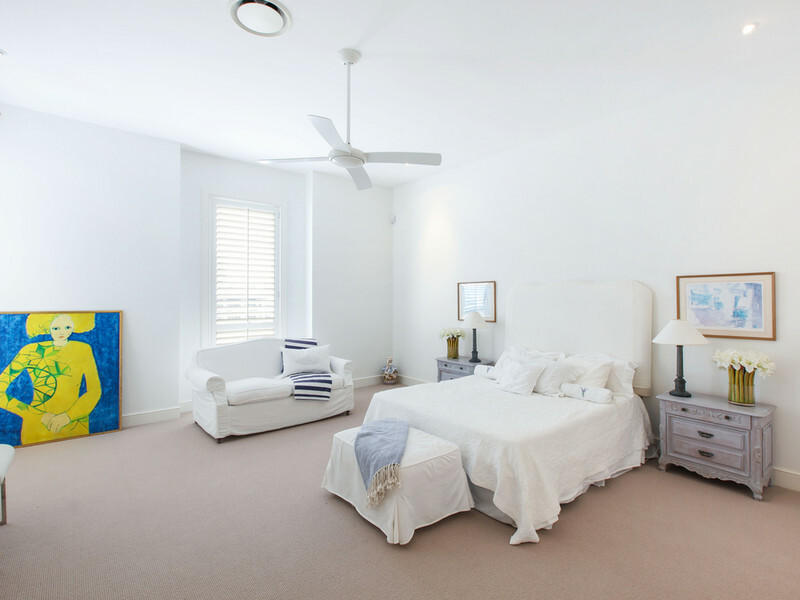 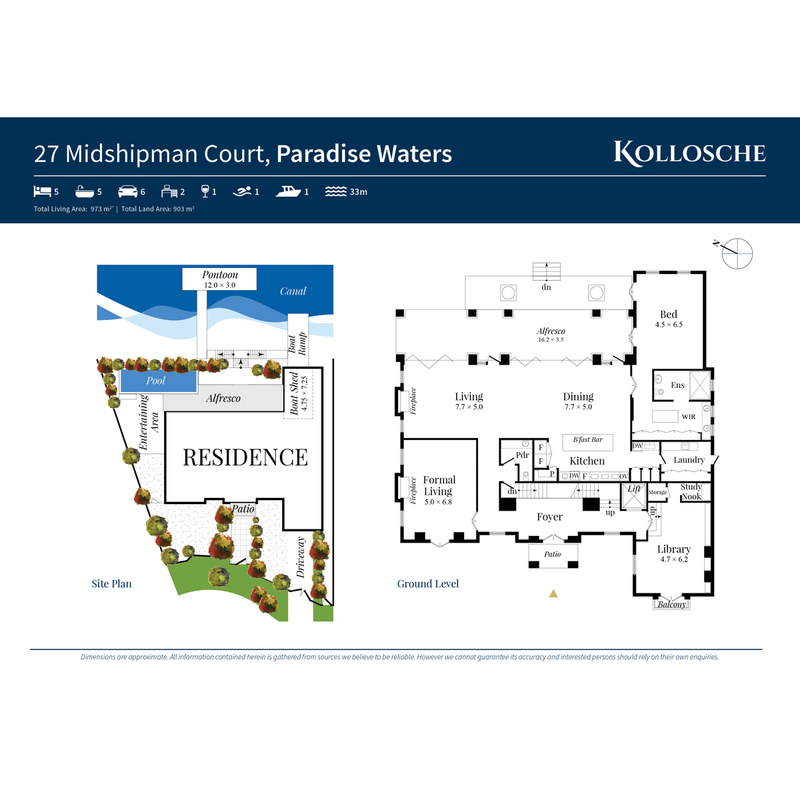 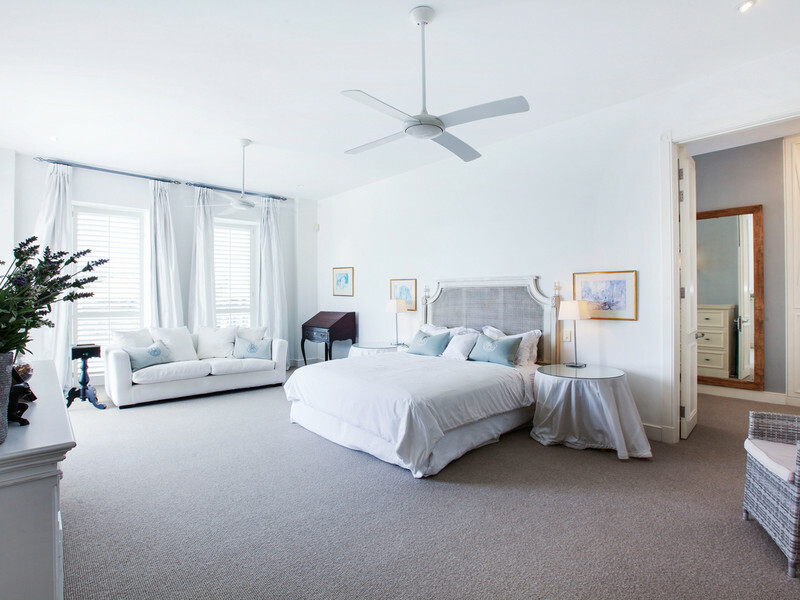 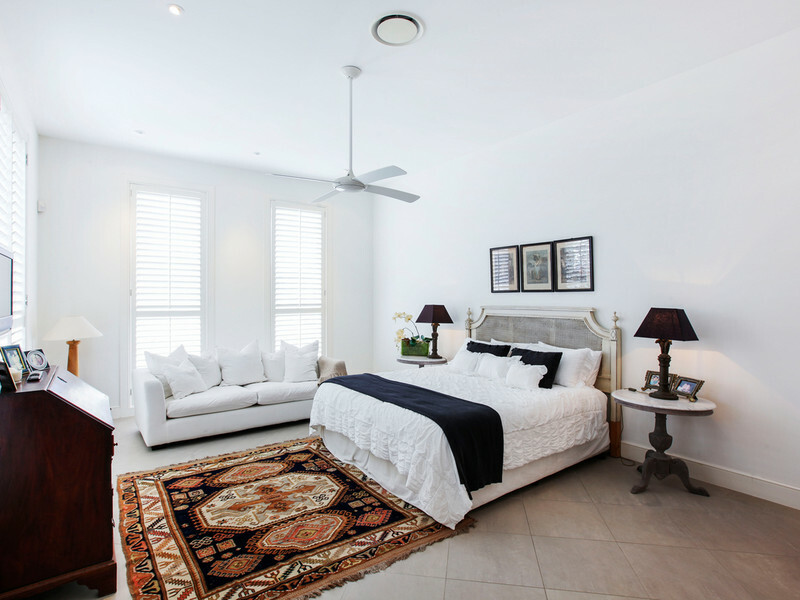 Additional conveniences include three-phase power, CCTV security, video intercom entry, electric driveway gates, ducted and zoned air conditioning, and under floor heating in all bathrooms, master suite and lifestyle area.